This 1994 Pontiac Grand Am was purchased for $100 from a towing company in Michigan last summer. Its owner (one "Gabe") then set out to convert it into a Batmobile. According to the story at GeekTyrant "After a few necessary repairs, work proceeded: Gabe sawed off the crushed roof and built a custom frame for the new roof and windows. Inspired by the Batmanesque charm of his creation, Gabe then rigged up and riveted on fins, reworked the nose, and spray-painted the car matte black. The car even features high-tech theft-prevention gadgets the likes of which even Wayne Industries couldn't develop. When thieves tried to steal the car last year, the steering wheel broke off. In the process of trying to hotwire the car, they also fixed the brake lights." 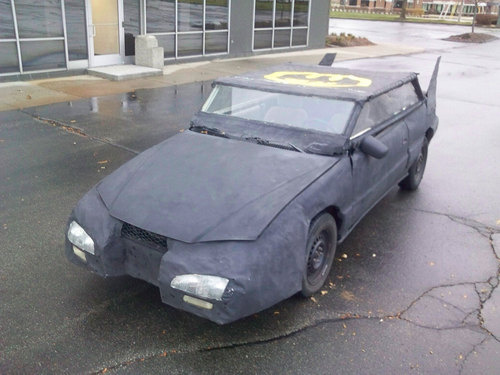 Click on the link above for more photos of the "Batmobile", which is now listed for sale on Craigslist. Price for this crimefighting car: $600. And in related news, Batman himself was arrested in Los Angeles on a loitering charge. I guess hard times have hit everyone... including costumed vigilantes.